Notice how the spread of the price bars have tightened since we entered the trading range as compared to the price rise just before it? It brings to mind Wyckoff Theory about price movement . . . “Effort” and “Ease”. Effort would couple to volume and Ease to price movement. The volume (effort) has picked up since the circled area and the prices have not moved much (ease), both intraday (bar spread) and overall. Clearly this market is at an equilibrium point where buyers and sellers are nearly equal. Since I have not noted Distribution of any significant amount, I feel that this is a Re-Accumulation period, and likely the move up will continue. 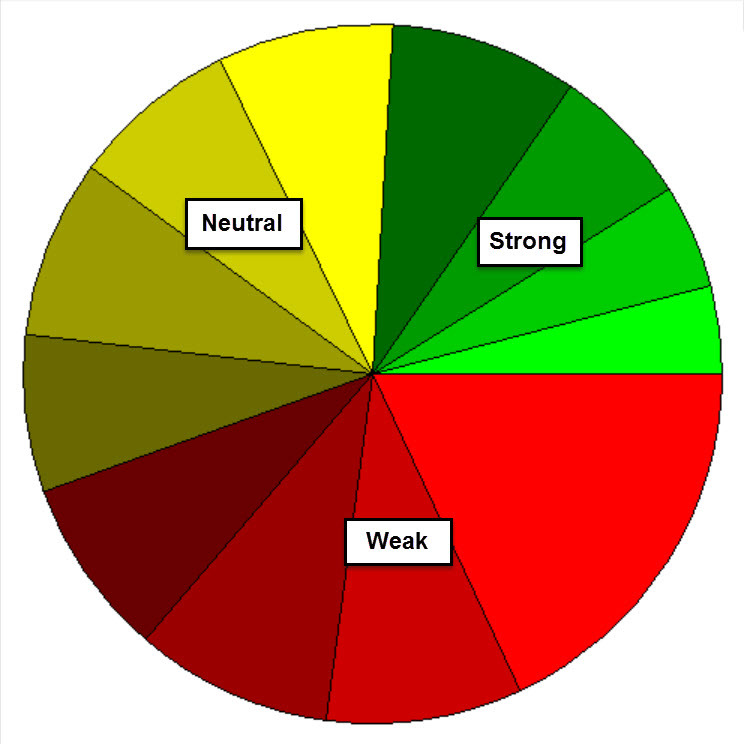 The pie chart above shows the number of stocks in the broad S&P 1500 Index that are showing strength, weakness or neutral as far as their price movement is concerned. Since over 75% of the stocks are weak or neutral that confirms this trading range. Prices could break out either way. I should also point in the price bar chart above that the new “Sentiment” indicator (blue line) is right at dead neutral. So what’s an investor to do? I’d say be patient and wait. Be prepared to head in either direction, but if your stock is showing excessive weakness (worse than the market), sell. Good growth stocks will correct, but hopefully not by much IF they are being held in “strong hands” and not just by short term momentum traders. Eyes remain on interest rates (the FED), the strong US Dollar and the geo-political situation(s). News is the wild card here. The market are not in a mood to absorb bad news and that could push it heavily in a down direction. But we can’t predict that. Stay flexible and have a good week …….. Tom ……..